Sometimes, in the winter, you just need a new hat. 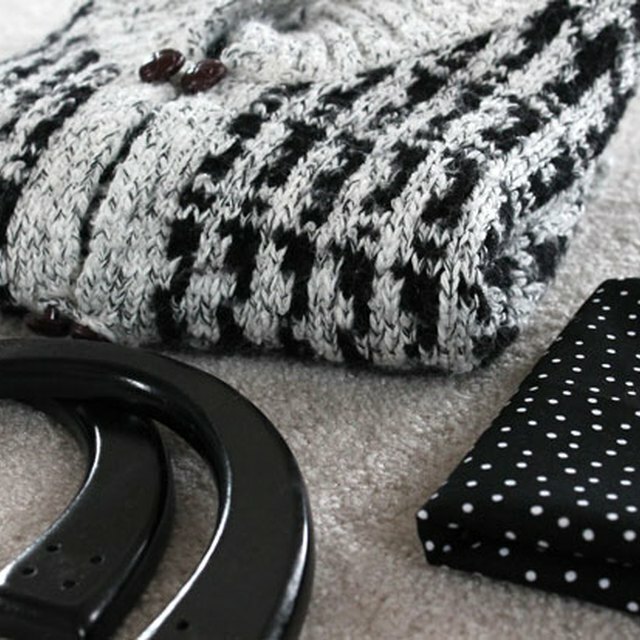 Make one from an old sweater in less than an hour to quickly and easily spruce up your winter wardrobe. Choose an old thrift store sweater with a nice color or pattern. Place a well-fitting hat onto newsprint or a flattened paper bag, and trace around it to create a pattern. Add 1/2 inch around your traced pattern line for a seam allowance. Use regular scissors to cut out the hat pattern. Include the 1/2-inch seam allowance when cutting out your pattern. Lay your sweater out flat and line up the bottom straight edge of the pattern with the bottom straight hem of the sweater. This will create a ready-made hem for your hat. Pin the pattern through both the front and the back layers of the sweater. Use fabric scissors to cut around the pattern through the front and back layers of the sweater. Remove the pattern from the hat pieces. Place the right sides of the hat pieces together and pin. Leave the bottom edge open. Use a medium tension setting to sew a 1/2-inch seam allowance around the curved edge of the hat with a universal 90/14 needle. Remove the pins as you sew. Cut small notches out of the seam allowance along the curved edge, about every inch or so. Be very careful not to clip into the stitches. This will remove bulk when you turn the hat right side out and help the seam to lie flat. Turn the hat right-side out and press the seam with a hot iron. You could stop here and have a plain hat or spruce it up with a handmade pompom. Use an X-Acto knife to cut two corrugated cardboard circles that are 3 inches in diameter. Cut a circle out of the center of each of the cardboard circles that is 1 1/2 inches in diameter. Place the two cardboard circles together and wrap yarn around them, threading it through the center hole and wrapping it around the outside of both cardboard circles. I used about 7 yards of yarn for this pompom. To make it easier to wrap and to keep the yarn from tangling, cut two 3 1/2-yard pieces of yarn, fold one in half and wrap until you run out of yarn. Then fold the next piece of yarn in half and finish wrapping. Keep wrapping until you have wrapped two layers of yarn around the circles. This will give you a nice, full pompom. Slip the fabric scissors between the two layers of cardboard and cut the yarn around the outer edge of the circle. Before removing the cardboard, slip a 12-inch piece of yarn between the two layers of cardboard and tie a tight knot around the middle of the pompom. Carefully remove the two layers of cardboard. Fluff up your pompom and trim if needed. Leave the 12-inch yarn piece attached. Thread a yarn needle onto the end of the 12-inch piece of yarn. Use the yarn to hand sew the pompom onto the top center of your hat. Trim away the excess yarn when you finish attaching the pompom. 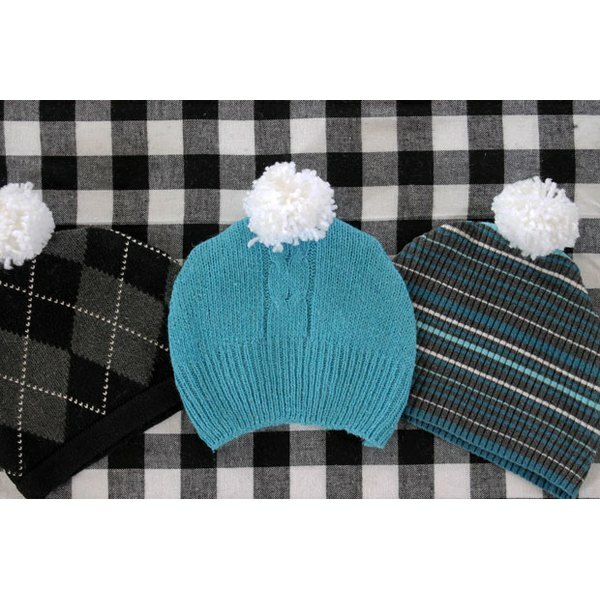 Stay warm while looking good in your new pompom sweater hat. Beth Huntington is founder and designer of “The Renegade Seamstress”, a blog known for its simple, stylish and straightforward photo refashion tutorials. She wants to inspire even the most inexperienced sewists to try this environmentally friendly and economical way to transform thrift store finds into fashionable pieces of clothing that can be worn anywhere.